Whether ski trip or winter holiday: both Planai and Hochwurzen ski ranges offer you the most polished ski experience proposal in Austria. 22 modern lifts and 32 slopes offer pure ski fun for skiers and snowboarders. Only a few metres from the Mountain Station of the Planai cable car is the Planai Adventure Park. Climb from treetop to treetop at over 1,800 m above sea level - and enjoy an impressive view: the Ennstal is at your feet and you’re eye to eye with the Dachstein massif. Largest connected skiing area. Downhill runs with over l,000m difference in altitude promise varied piste fun – perfectly connected with modern lifts and cable cars. Ideal for skiing pleasure! We would recommend the Judau lift in the skiing centre in the Angertal Valley for beginners. Especially popular: the Hohe Scharte Nord (H 1 + H 2 + H2a) – and with a length of 10,4 km and a difference in altitude of 1,440m it is one of the longest downhill runs in the Eastern Alps. The ski area is great for families and lies in the center of the Salzburger Land. The high-mountain skiing area for all the family is famous for excellent pistes and guaranteed snow cover until late into spring. The natural snow pistes are mainly of easy to medium difficulty. Weißsee Glacier world is a skiing area that guarantees fun skiing and recreation for piste skiers as well as snowboarders and off-piste enthusiasts. Enjoy 21 km slopes as well as a toboggan run and a fun park at the ski area Postalm. Non-skiers will also find beautiful snowshoe trails and an ice rink. The family-friendly ski area at the gateway to Salzburg City. Attractive pricing, even for last-second planners. The Gaissau-Hintersee ski area is a very special, well kept secret. Whether on skis or a snowboard, with 40 kilometers of superbly groomed slopes awaiting you, those pure joys of winter are about to come true. Lungötz offers 2 km slopes and modern lift facilities. You will also find cross-country trails, snow shoe trails, winter hiking trails or enjoy the beautiful scenery on a romantic horse sleigh drive. With 55 ski lifts and 170 km of slopes (all levels of difficulty), everyone is sure to find the fun they have been hoping for. Numerous mountain huts serve up mouth-watering country cooking accompanied, of course, by splendid mountain vistas, so that interrupted high spirits are virtually guaranteed. St. Johann - Alpendorf is the first entrance to the Salzburger sports world - in the centre of Austria`s largest ski pleasure the Ski amadé. Enjoy 860 km of slopes and over 270 lifts with just one ski pass. The ski area Reiteralm offers 30 km slopesin all difficulties as well as a toboggan run. Modern lifts take you to a snow secure and sunny winter sports area. Skiing at the Hauser Kaibling - pure pleasure! More info at www.hauser - kaibling.at or at www.facebook.com / HauserKaiblingFan This mountain gives you mountains! All those who are in search of the finest ski slopes, should make their ski-swings on the Hauser Kaibling, which is live thereby in ski amadé. The Hauser Kaibling is the first access point on the east-side in the Schladminger 4-Peak-Ski-Area and winter sports fans will find there a skiing-paradise. The unique GUARANTEED PARKING makes it easy to start the day and the NEW ski depot at the Valley Station offers pure comfort! Once arrived on the top of the mountain at 2,015 meters above sea level there will open you the white expanse of the Hauser Kaibling . Well groomed slopes (make sure our employees and more than 200 snow cannons), 14 rustic chalets - all with service -, free W-LAN on the mountain, unforgettable places and more make the Hauser Kaibling one of the most attractive ski mountain. From Gerlos you have direct access to the large skiing area in the Zillertal Arena. 166 km of slopes at altitudes between 1,300 m and 2,500 m and 49 modern lifts are on offer from the beginning of December until Easter. Numerous huts and snow-bars invite you to stop by. On newly created downhill ski runs you get back to the valley conveniently. And the notorious après ski in Gerlos is, of course, an essential feature after a wonderful day of skiing or snowboarding! At the Mölltaler Glacier you will find 53 well groomed slopes in all difficulties and furthermore a beautiful mountain panorama. The snowpark promises a lot of fun for snowboarders and skiers. Cross-country skiers can enjoy the beautiful scenery on the 2.5 km trail. In Mallnitz skiers and snowboarders get their money`s worth on the well-groomed slopes and at the funpark as well as the freeride area. The wide slopes are ideal for carver and families. 70 wonderful kms of slopes in perfect conditions, as well as 28kms of cross country routes are waiting for you. There is also a big variety offside the slopes, like cosy horse-drawn carriages, various snow boots walking trails, wonderful ice skating places, tobbogans and a lot more. Just the perfect place to give yourself a break and relax. The popular ski area with its well groomed slopes are ideal for families with children, beginners and returner. Enjoy the idyllic winter landscape and a stunning panoramic view. Advanced skiers may give the unprepared 6km skiroute a try. The first Schischaukel of the Gasteinertal offers a diverse family-friendly supply of varied descents, from the beginner to the expert, high comfort with modern cable railway and lift facilities and an unique, particularly ethnic ski huts-atmosphere. With the Gipfelbahn Fulseck you can reach the highest point of the Schischaukel Dorfgastein-Grossarltal. Winter in Kitzbühel means extraordinary experiences thanks to a wide selection of sports and activities. Skiing, snowboarding, cross-country skiing, winter hiking, ice skating and many more exciting outdoor activities in spectacular natural surroundings all but guarantee long-lasting memories. Die Skiabfahrten sind weit und vielfältig, die Pistenpflege ist vorbildlich. Gemütliche Skihütten, Schneebars und Sonnenterrassen laden zu Einkehrschwung und Après Ski. Ein Skigebiet also für besondere Ansprüche - für alle Könnerstufen und jeden Geschmack. Sollte jemand während des Tages noch nicht genug auf den „Brettln" gestanden sein, gibt es in St. Johann in Tirol die Möglichkeit, sich auf der mit Flutlicht ausgeleuchteten Piste auszutoben! 35 km slopes await you at the ski resort Fieberbrunn. Well groomed slopes, broad carving slopes as well as powder slopes and a race course make sure to spend a great winter holiday in Tyrol. Up where the sun shines between 1100 m and 1900 m altitude, the ski area of Steinplatte is where winter enthusiasts will find their own personal paradise. On a length of 36 km in total, 15 pistes, which are rich in diversity and very well prepared, offering the most modern lift facilities, an action-packed snowboard-fun park and traditional Alpine huts, perfect snow conditions stretch out in front of you – and there is any amount of sunshine! The ski area near Pillersee offers 15 well groomed slopes in all difficulties as well as 5 km toboggan run. Bobo´s children park is ideal for the children. Snow and nature experience in 3,000 metres above sea level Experience the complete activity programme of the Alps from winter sports to views, from hiking and mountain biking to sightseeing in Gipfelwelt 3000 on 365 days a year. Families and beginners find the perfect ski resort at the Maiskogel in the centre of Kaprun. The "Maisiflitzer“ alpine roller coaster at the lower terminus promises fun and action all year round. Amongst the Kitzbüheler Alpes you will find the romantic and family friendly holiday paradise Kirchdorf. Thanks to its small ski area with long and gentle slopes, Kirchdorf is ideal for beginners. Experienced skiers and riders will find plenty of challenges in the nearby ski area. Those with a romantic spirit will love a horse-drawn carriage ride through the magic winter wonderland. Zell am Ziller, liegt im Herzen des Zillertals und ist gleichzeitig auch der erste Einstieg vom Zillertal aus in die Zillertal Arena, dem größten Skigebiet des Zillertals. Die neue Talabfahrt bietet allen Gästen, die von Zell aus in die Zillertal Arena einsteigen, den großen Vorteil, direkt mit den Skiern / Snowboard bis ins Tal abfahren zu können. Fährt man vom höchsten Punkt der Arena - dem Übergangsjoch - los, dann legt man bis zum Ziel im Tal unglaubliche 2.000 Höhenmeter zurück. Am Hainzenberg befindet sich mit einer Ausdehnung von sieben Kilometern die längste Rodelbahn des Zillertals. Die Rodelbahn ist bis 1 Uhr nachts beleuchtet. Highest situated skiing area. Sportgastein is the village, where sporty types feel at home. Skier’s dreams become true, as soon as the snow conditions allow the leaving of the carpet of prepared pistes – as well as in powder snow or on crispy spring snow. Special tip: Ski route 1 + 2 + 3: Powder as far as the eye can see. After a thousand metres of skiing in deep powder snow or the dream of mogul pistes you will land at the valley station of the Goldbergbahn. Experience a romantic winter world filled with all kinds of fun and action. 160 kilometres of slopes for every ability level, state-of-the-art lifts? and great snow conditions all the way until springtime. LIMITLESS SKIING FREEDOM! A hands-free system at the lifts is especially customer-friendly: move through the lifts quickly, without ever having to dig around for your ski pass? it stays safely tucked away in your pocket. A deposit of? 2 is required, which will be refunded in full when you return your pass either at the lift ticket booths, or at other designated return points. The impressive Plateau of Hochkrimml offers marvellours skiing fun particularly for families. The area provides heavenly runs, a funpark and the great "Märchenwiese" which is a paradise for kids. Various slopes lead you directly to your accommodation in the snowy mountain hamlet. The possibilities for varied fun in the snow are almost endless at the Lärchenhof: the Lärchenhof ski school, children’s ski school, ski hire, sports shop, hotel’s own ski lift, weekly sledging and mulled wine evenings, curling, winter walks, cross-country, skating, biathlon and much more! We also offer free Lärchenhof parking spaces at the Steinplatte ski resort valley station if you prefer not to take the hotel’s own ski lift. In Bad Dürrnberg you will find well-groomed slopes as well as cross-country slopes and beautiful winter hiking trails through a romantic winter landscape. Only 45 km from Salzburg you can find the family ski area of Werfenweng sitting between 1000 - 1850 metres above sea level. For those of you wanting to try something different on your ski holiday, look no further than the toboggan run. If you want to be at one with nature then cross country skiing is the perfect activity for you. 30 km of wonderfully prepared track will take you through the Werfenwenger winter wonderland. Wagrain lies in the heart of the Ski Amadé winter sports region. Broad slopes, quick and comfortable cable cars, snow conditions you can always rely on, and all of this amid the biggest ski region in all of Austria. The long, outstanding slopes serve up all levels of difficulty and whisk you away - whether you are a skier or a boarder - into magical winter countryside and panoramas that are, quite simply, overwhelming. The Hochkönig ski resort is a true skiers paradise that simply can`t be matched. 33 lifts and 150 kilometres of non-stop connecting trails between Maria Alm, Dienten and Mühlbach will assure exhilarating action for expert skiers, snowboarders, new school fanatics and of course beginners! The broad ski areas are distinguished by family-friendly amenities and specials as well as exceptional snow conditions. Powder snow and freeride fun - the pistes are perfectly groomed and in top condition all winter long! To make every single day of your holiday a pure skiers´ delight you will find 270 km from beginners´ slopes to challenging pistes with runs right to the village. Extra wide carving-pistes, 60 cosy huts, 70 comfortable cable cars and lifts as well as several "hot spots“ for example World Cup runs, snow parks, freeride parks, skimovie, speed and race slopes, floodlit pistes and snow trails make your holiday to an unforgettable experience. The skiing area “Zillertal Arena” is the largest skiing area of the Zillertal valley and extends from the village Zell im Zillertal via Gerlos to Wald-Königsleiten and Krimml-Hochkrimml. The area offers 143 kilometres of slopes and 52 lifts, where skiers and snowboarders will find a variety of goods for beginners and pros. Skiing to an elevation of 2,500 metres and almost absolute guarantee of snow ensure a perfect winter holiday for the whole family. If you are a winter guest of Zell am See-Kaprun the multifaceted ski area Schmittenhöhe starts directly in front of your appartement door. The "Schmitten" is the mountain for families, Funslope fans and hobby skiers. There are pistes with diverse degrees of difficulty on 77 piste kilometers. The ski region is magnificent – Zauchensee is the highest ski region in the Salzburg sports world. Two metres of snow in the mountains into the spring is not rare here. You will find slopes in all difficulties - from easy for beginners to difficult for the advanced skiers. The family friendly ski area Mauterndorf invites you to spend your winter holiday in a beautiful scenery. Offering about 45 km groomed slopes as well as powder pistes - this ski region provides what your heart desires. You will also find about 200 km cross-country trails as well as a toboggan run which is also open at night. Surrounded by an imposing mountain world, in the midst of the Salzburg Sports World - the very heart of the Ski amadé, you will find the village of Eben im Pongau, a wonderful vacation destination. The short distances to the ski areas and numerous area attractions make Eben a vacation El Dorado for families, winter sports enthusiasts and recreation-seekers. In Faistenau kommen Genießer wie Profis auf ihr ganz persönliches Loipenerlebnis - mittels Flutlichtloipe auch bis spät in die Nacht. Filzmoos amongst the winter sports region Ski amadé is ideal for children, beginner and returner. The ski area offers broad slopes and therefor much space and safety. Snow region Flachau boasts the most innovative cable technology and systems, with a total of 150 hectares of skiing area, wide, perfectly prepared pistes, various downhill runs for all levels of competency and absolute snow guarantee due to the most modern artificial snow technology. A diverse range of pistes offers just the right thing for every level of ability. From the World Cup run, the self timing competition run, the floodlit ski piste as well as the family runs and the practise slopes, everything you need is right there on offer. The wide and clear slopes on the Fageralm fascinate many skiers and the rustic huts invite you to linger. Forstau is just the thing for lovers, families with children and lodge lovers. Sunny piste fun - away from the hustle and bustle! The ski lifts Goldegg are perfect for families and beginner. 12 km slopes and 4 lifts guarantee an idyllic and comfort atmosphere. The 7.5 km long slope can be reached in 20 minutes from the mountain station of the Unterbergbahn. Cross-country skiers will find a romantic cross-country trail through the Hellbrunner Park. The Hochkönig ski resort is a true skiers paradise that simply can not be matched. 33 lifts and 150 kilometres of non-stop connecting trails between Maria Alm, Dienten and Mühlbach will assure exhilarating action for expert skiers, snowboarders, new school fanatics and of course beginners! The broad ski areas are distinguished by family-friendly amenities and specials as well as exceptional snow conditions. Here on the Maiskogel, 68 hectares of slopes - serviced by snowmaking equipment and excellently groomed - are just waiting to be discovered by you. A professionally designed funpark for freeskiers and the Maisiflitzer, our year-round alpine slide, add the perfect finishing touches to all we offer. Winter holidays in Kleinarl - when you are sure to find the fun you seek, be that on one board or two. Whether alpine skiing or Nordic, whether on a snowboard or cross-country skis - the selection is broad. But you will look in vain for the hectic hustle and bustle of other ski resorts. This is what a relaxing winter vacation in Austria is all about. In winter, Abtenau is one of the most beautiful ski resorts for families. The slopes are moderate and perfect for beginners and returners. The new floodlight toboggan-run guarantees a lot of fun for the whole family. You can also get your exercise cross-country skiing on one of the numerous trails. Annaberg is an insider tip for your family-friendly winter holiday at 850 metres altitude. Admittedly, there are certainly more well-known winter sport towns in Salzburg – but finding a prettier ski centre than Annaberg in the Dachstein West area is certainly a bit trickier! Ski enthusiastics can enjoy 5 km slopes in St. Martin. Further more you will find 40 km cross-country trails, snow shoe trails as well as a toboggan run. Those who like it romantic may enjoy a drive in a horse sleigh around the village. The lovely skiing town of Russbach in the middle of the Salzburg section of the Dachstein West ski area offers you leisure opportunities which are plenty and varied, and also good-value. In just a few minutes you’ll find yourself on the ski piste, surrounded by the superb mountain panorama. At the ski area Mariapfarr on the Fanningberg you will find about 30 km of well groomed slopes as well as a 8.5 km long toboggan run. Beginners and returners can also find a ski school. Cosy ski huts will serve you culinary delights. The Grossarl Valley-Dorfgastein Skiing Arena offers all that a skier and snowboarder could desire. Assured snow, wide runs, cosy ski huts and much more! The ski area Wildkogel offers great conditions for families, skiers, boarders, carver and powder freaks. 75 km of well groomed slopes as well as an all-round winter offer provide unforgettable holidays. In Obertauern you are at the heart of all skiing activity and always within a few minutes of any point in the community. The lifts are so cleverly situated that one can ski all the runs, clockwise or anticlockwise, and always return to one´s starting point. It is known as the “Tauern round”, skiing in perpetual motion and unique of its type within the entire region of the Alps. This skiing arena is served by 26 cable-cars and lift facilities, which function as shuttles and connecting elements to the approx. 100 kilometres of runs. Radstadt zeichnet sich durch das breite Angebot an bestens präparierten Pisten aus - ein Eldorado für Carver, Schifahrer und Boarder. Vom Anfänger bis zum Pistenakrobaten findet hier jeder sein Terrain. Rauris offers the most beautiful exercise meadow for children and adults. Soon comfortable cabin railways bring you up on 2175 m altitude. Eastlateral, in the best way prepared runways, guarantee you powder snow runways until late spring. Let yourself get bewitched of the variety of the valley of Rauris. Off of the bustle in large skiing areas, in Rauris, a small but much finer skiing area expects you. The Hochalmbahnen is a small clear ski area, which offers with its various runways for each skier and snowboarder an exciting runway experience. 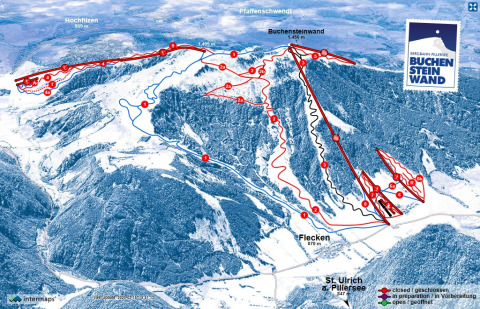 Skicircus Saalbach Hinterglemm Leogang – the largest continuously linked ski area in Austria. Unlimited piste magic on over 200 km of fantastically prepared pistes. From gentle slopes to black World Championship runs, from Fun Park to racing runs to mogul piste – there is something for everyone here. The ski area Almenwelt Lofer in Salzburg offers 46 km well groomed pistes and slopes and 10 lifts and cable cars. Almenwelt Lofer is the ideal ski area for children and beginners with the children`s lift at the valley station and the 140 meter long magic carpet (conveyor belt) on the top, especially for children and beginners. Cozy restaurants spoil you with delicious regional food. A new large water reservoir and 70 snow machines make 75 % artificial snow coverage possible. Der Familienberg Hinterreit ist das ideale Familienskigebiet. Bestens präparierte Pisten und moderne Schleppliftanlagen garantieren Skispass für die ganze Familie und für alle kleinen und großen Anfänger gibt es einen eigenen Übungslift. Mit seinen langen, schweren Abfahrten ist der Graukogel eine echte Herausforderung für Top-Skifahrer. Der Großteil der Abfahrten liegt im Waldbereich, ist dadurch besonders windgeschützt und erlaubt auch bei schlechter Sicht eine gute Orientierung. Einziger Nachteil: Keine direkte Liftverbindung zu den anderen Skigebieten in Gastein. Das Skigebiet Heutal bietet bestens präparierte Pisten sowie 35 km Langlaufloipen. Zudem können Sie sich am Eis oder auf der Rodelbahn vergnügen und sich anschließend in den Wellnesseinrichtungen entspannen und die Seele baumeln lassen.